The filterable list of annotations. 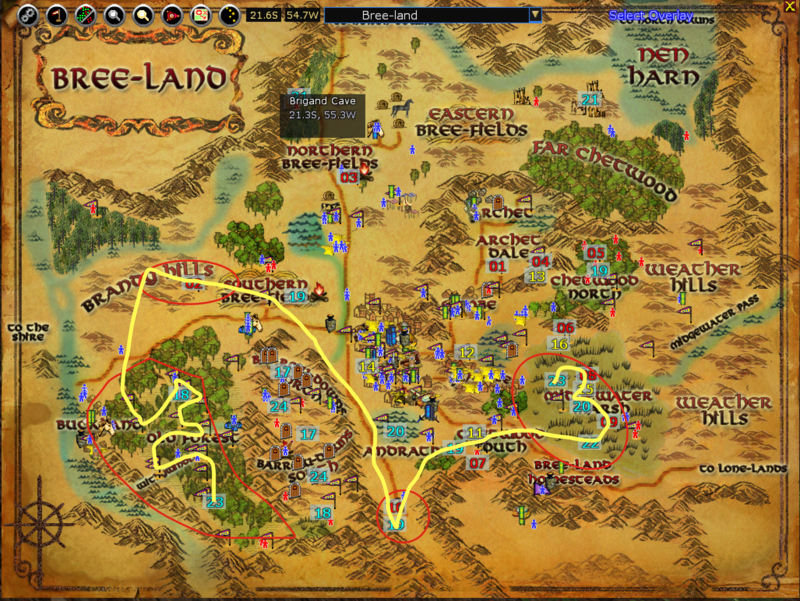 Breeland map, all icons enabled, NPC Tarburz hover info displayed. NOT JUST FOR THE 'MOORS ANYMORE! Ever wish you could annotate your own copy of the parchment maps? Want to keep track of where that rare mob spawns? Or where the best places to mine ore are? Want to know quickly where Soldier Pashum is located? Ever wish you could just click on the map to activate your creep's map instead of trying to find the map in your inventory or remember the right hot key you assigned, especially after taking a break for a month or two? Ever wish there was a way to let new players know what the abbreviations we use all mean? Welcome to MoorMap, the map with More. Originally, only the Ettenmoors were included, but I have expanded to all of the parchment maps so that players can mark any location they want to be able to find again. All of the parchment maps and many interior/instanced areas are available as well as a couple of city maps that Turbine has not yet added. There is a filterable list of annotations, just enter a few characters in the name of the location or NPC you are looking for, then click on the entry in the list and a "ping" will show up on the map telling you where it is or right click on the entry to see the annotation detail. Hover over any icon on the map to see a brief summary of the annotation or left click the icon to see the detailed entry. You can right click on the map and add your own annotations. The entire map can be moved and resized. You can also change the language, colors, opacity and other customization setttings in the Options Panel (click the gears button on the top left of the map). If you have Lunarwater's Waypoint installed, you can enable integration with Waypoint in the MoorMap Options panel and then any time you click on an annotation's coordinates (hover over the annotation to display its coordinates) Waypoint will be activated for those coordinates. Just download the Zip file and unzip it to your Plugins folder. There are no dependancies on any outside files. When upgrading from a prior version please either exit the game client or execute "/plugins refresh" in the chat window after copying the files but prior to executing "/plugins load moormap" for the new version. To load the map, use "/plugins load moormap". NOTE: If using a plugin manager to load "MoorMap", do NOT load "MoorMapDefaults", "MoorMapLoader" or "MoorMapTerminator". They are launched by the plugin itself as needed and loading them automatically will cause undesirable things to happen. When first loaded, the map is minimized by default. There will be two icons in the extreme lower left of your screen which can be dragged to any location you want (you must hold the Ctrl key while dragging to move the icons). The left icon is the Minimized Icon and is used to display the map. The right icon is the Quick Annotation control and is used to add an annotation for your current target at your current location. You can hide either or both of these icons in the Options Panel . To open the map initially, click the Minimized Icon. To add a custom annotation, just right click on the map, fill in the information and click "Save". You can also use the Quick Annotation icon, just target a resource node or item while standing next to it and click the Quick Annotation icon (looks like a flag) and an annotation will automatically be added to each map that matches your current coordinates. There are two search functions, local and global. They are both case insensitive and accent insensitive meaning that you can type search text without capitalization or accents and it will still match. 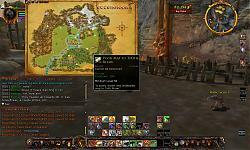 To find a location or NPC on the current map, click the silver magnifying glass button. A filter field and list will appear on the right size. If the filter field is blank, all annotations are listed alphabetically, grouped as "Locations", "Map Destinations", and "NPCs". If you type in the filter field, only those items with the filter string in their name will be displayed in the list. Clicking on an entry in the list will hide the list and cause an animated "ping" to appear on the map at the location of the selected entry. You can also hide the list by simply clicking anywhere on the map. You won't be able to click on the icon under the ping or see the hover information until you click once on the "ping" to clear it. To search all maps, click the gold magnifying glass button. A search dialog is displayed, type in the text to search for and click "Search". All of the default data files are searched and the matches are displayed in a list. Click an entry in the list to display the map with a "ping" at the location. To use the map to activate a Map Item or Creep Map Skill, just right click on the icon on the map at the destination location. As long as the map location is available and not on cooldown the map will activate. Note, if you have both of the maps to Gramsfoot or both of the maps to Glan Vraig, only the better map will be activated. 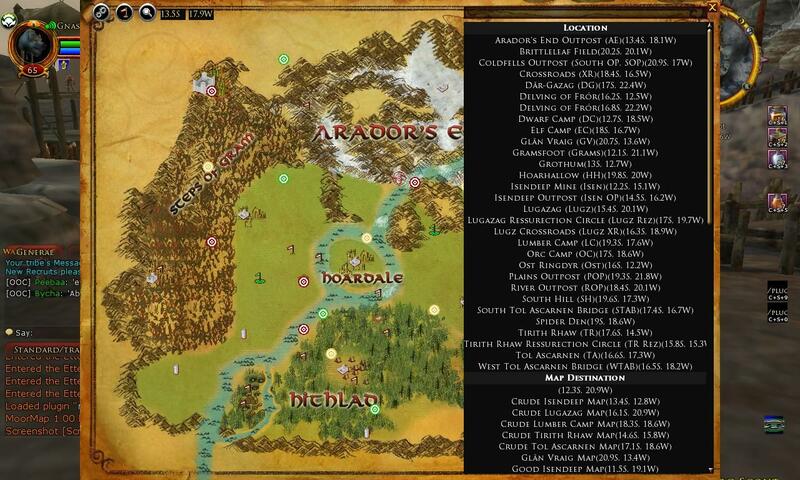 MoorMap supports Server specific annotations for the Ettenmoors. To use a specific server version, just open the Options Panel, select your server and save your changes. If your server has special names for any Ettenmoors location and you would like those names included in the defaults for your server, please submit them as Feature Requests (see the top right of this web page). When submitting a request, please include your server name, a short name for each location, a description of the location (and if possible a reason for the name) and the location map coordinates. Please keep the annotation names and descriptions appropriate. Submissions that are acceptable will automatically merge with the existing defaults when you download and install an updated version. There is an additional chat command, "/moormap ping" which takes a number of parameters and will allow external plugins add annotations and display them on the map. See the Readme.txt file for more details. I continue to add instance/dungeon maps. Foreign language support is very limited at this time. Thanks to a discussion with Therzok on lotrointerface.com, I was motivated to revisit the local search filter panel. More specifically, the application of the filter panel search text to the actual map annotations. I had originally disabled this functionality due to significant impact on performance, however, I realized I had not revisited this functionality after changing the way annotations were loaded and handled by the map (several versions and many years ago). With the enhanced annotation handling, I was able to re-implement this functionality so the local search filter not only applies to the list of annotations in the filter list but is also applied to the actual annotations on the map. SSG somehow broke functionality of the Control key so I have changed Breadcrumbs to work by holding Control OR Alt while pressing the position icon at the top of the map (or executing the /loc chat command). I also changed moving the quick annotation tool icon and the map icon to work by holding Control OR Shift OR Alt and then left dragging the icon. Fixed bug in External Ping command (not sure when this bug crept in, but it looks like it was there for a while) that prevented ping from actually showing up. The syntax for the new ping command is very similar to the old one but with region instead of map ID, i.e. "/MoorMap ping_r region:NS:EW:Name escription"
Updated Rhovanion map and connectors for U22 and revised player positioning. Fixed bug reported by Invizet when loading the Ettenmoors map with the Russian language selected. There is a known issue when using the global search with DE/FR clients - if the name or coordinates don't return correctly, clicking on the returned value doesn't re-position the map at that location. I will be looking into this further for the next release. -- note, Lua window titles do not support cyrillic fonts so they will probably show as "?????" characters when Russian is selected. -- additionally, popup menus do not support cyrillic so the help text and other popup menus will also show as "?????" characters. -- both of these have been submitted as bugs but it is doubtful that SSG has the resources to fix this at this time. Fixed miscellaneous strings missing from translate table. Fixed a bug in the quick annotation tool that was causing it to fail for DE/FR clients. Apparently Turbine stopped using native strings for coordinates so location responses to the ;loc and ;pos chat commands are now all in english regardless of the current language (and probaby have been for a while, this bug was probably added when EU servers were taken over from Codemasters). Added ability to resize the markers for Berry's Deed Data requested by fade2gray. Just click the +/- on the Marker Size in the Legend - be patient, it takes a second or two to refresh. Added The Wastes map and default data. 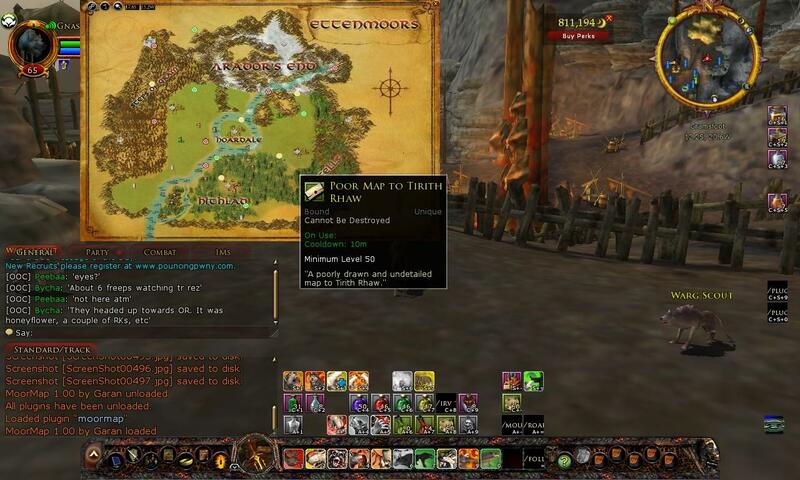 Changed some default annotations in Rivendell and Trollshaws due to past game updates. Fixed Evendim Treasure Caches that were erroneously flagged as NPCs. Fixed Euro handling bug reported by Murxx. Fixed settings bug when switching between EN and DE/FR clients. Fixed missing Treasure Caches in Far Anorien reported by Jethpriel / verified by Murxx. Major revamp of Default data processing. No more processing screen. Much faster initial load after updates. Slight (very slight) performance increase when changing maps. Added Custom Annotations to global Search in response to request by fade2gray @ lotrointerface.com. Added radio buttons to select search type, "Default","Custom" or "Both". Note, this may have a slight performance impact on slower/older machines as the search has to load its child plugin for every map now instead of just once per search but once the search is complete, the resources should all be released so there should be no permanent increase in resource usage. Added Icon Maintenance for assigning custom icons for annotations. Now you can replace the default icons with your own images, simply copy an appropriately sized (32x32 for normal/hover icons, 16x16 for small icons) .jpg or .tga file to the Resources folder, right click the annotation type in the Filter panel to open the Icon Maintenance window and enter the file name (without path) for the icon you wish to use and click Save. Each annotation has three icons, Normal, Hover and Small (used in the Filter Panel). If you want to restore the default icon, simply click Reset Default on the Icon Maintenance Window. You can use other sizes than 32x32 and 16x16 but they will be cropped/tiled when displayed. Note, you can also use built-in resources if you know the resource ID, just enter the number instead of a file name. Added separate icon and filter options for Treasure Caches (requested by Jethpriel). Existing default data Treasure Cache Points of Interest should automatically use the new icon. Changed "Sage's Lockbox" to "Sage's Locker" (reported by DJPorterNZ) and other moria crafting nodes that were changed. Changed all farmlands to simply "Farmland"
Fixed Search Window location bug when resizing main window reported by bunny. Added "pin" to keep Annotation Window open. When pressed in the window will stay open even when the map is closed (but can still be dismissed by clicking OK or the close button). When un-pinned the window will close when the map closes as normal. Modified the "Show Location" function - if the player can not be shown on the current map then the "best" fitting map will be displayed. Note, this may not coincide with what the in-game map considers the correct map as that information is not exposed to Lua. Removed language specific maps now that Turbine has moved the language specific maps back into the language libraries. The hardcoded map images were blank, so the client now selects the image based on the client language. Basically, Turbine went back to saving language specific maps the way they did prior to Isengard so I had to revert my display mechansim to avoid blank maps. will show the "Select Overlay" message - hover over the message to display the available overlays. You can click the entries in the legend to activate a "ping" on the map to make the deed markers easier to find. Slayer Deed Recommended Areas can have more than one location per map so they can be listed more than once in the legend. Changed settings to store at the Character level instead of the Account level. When loaded on a character for the first time settings will automatically inherit the last character's settings or defaults if the plugin has never been loaded on any character. Fixed bug in placement of hover help for control buttons when map was less than full screen. Changed the way the quickannotation icon is selected for moving. If you hold the Ctrl key BEFORE moving the mouse over the icon, you can grab any part of the icon to make moving it easier. Fixed the Good TR and Poor TR map locations (they got swapped with the Ettenmoors revamp and I kept forgetting to fix them, thanks to LagunaD for reminding me). Fixed a bug that would cause overlays to improperly resize when the map was resized if they were a different original size than the map they were displayed on. Fixed incorrect annotation label. "Writhenbores" was incorrectly labeled "Erforgh Cleft". reported by Areswolf. Updated default data for Moria revamp. Modified Annotation pop-up dialogs to include Location. Annotation pop-up text is now selectable for copying to clipboard. Fixed bounds on Byrgenstow Upper and Lower for Breadcrumbs/Position. Changed map for Byrgenstow Upper and Lower to 1024x768 and added annotations. Added a check to automatically remove out-of-bounds annotations the next time a map is loaded - this will automatically fix the Sprigley's Cellar (or any other map) custom annotation file by removing annotations that were accidentally added due to invalid bounds. Added an Overlay list to the main map window for quickly turning on/off overlays. If any overlays are defined for the current map, the "Overlay" caption will appear next to the map select box. Hover over or click on the "Overlay" caption to display the list of defined overlays and check/uncheck to show/hide the overlays. Fixed bug in Breadcrumbs that would save the breadcrumbs to the wrong map when switching maps. Fixed a bug in Breadcrumbs that could require the user to switch maps or reload the plugin to get breadcrumbs to display after clicking "Clear" and then adding a new breadcrumb. Fixed interior bounds for Thorin's Hall so breadcrumbs and player location now work in Thorin's hall upper and lower. Fixed some inconsistent display mechanics with F12 and Escape. Added hover help for control panel icons. Added Overlays - users can now view Overlays on maps. An Overlay is mearly a transparent image used to show pathways, directions, guides, etc. on top of a map. Users can make their own overlays as well as displaying built in overlays. To open the overlay selection and maintenance window, click the Overlay button in the control panel near the top left of the map. To add a custom overlay, create a .tga file (more detailed instructions are available in the readme) with transparency and copy it into the GaranStuff/MoorMap/Overlays folder (or a subfolder within the Overlays folder). Then in MoorMap, select the map for the overlay, then click the Overlays button, select "New" and enter the info for the overlay. This should make it fairly easy to add "guides" to maps and will be even more useful as additional interior maps are added. Users may also want to add overlays to show good areas for grinding deeds, questing, etc. Maps can have multiple Overlays and the user can decide which if any are displayed as well as the order in which they display. Breadcrumbs allow you to mark your way by putting a flashing trail of dots where you have travelled. Since LotRO's implementation of Lua does not allow us to automatically retrieve player position, you have to hold down Ctrl while entering the /loc command. The easiest way to do this is to bind the /loc command to a built-in quickslot which uses the Ctrl key as a modifier. Otherwise you can also drop a breadcrum by holding Ctrl while clicking the "Location" button on MoorMap. It is important to remember to hold the Ctrl key until the chat message displays with your location (just hold it for half a second after you click the button). This is because MoorMap's breadcrumbs are actually triggered by the chat message response, not the actual button press. Breadcrumbs are persistant until manually cleared using the "Clear" button on the Breadcrumbs window - click the new "Breadcrumbs" button to display the Breadcrumbs Window. You can also change the color of the breadcrumbs in the Breadcrumbs window. Fixed a couple glitches in percent sizing. Users will no longer get an error if they change to a smaller resolution before unloading the plugin but the map may be too large to display and the user will have to unload and reload to force it back to a size that fits on screen. That's the best I can do until Turbine exposes an event for display resolution changes. Hotfix for the missing defaults, loader and unloader plugins. Added Tal Mathedras maps (Before and After have distinct data points). Updated Great River and Stangard map backgrounds. Changed Iron Pit map from the compass version to the Turbine art version. Re-added the Option Window and Button (I just couldn't get used to having to open the plugin manager and then find the plugin to get to Options). If you use the Plugin Manager to set options, the panel will show there by default. If you prefer to use the button on the map, the options panel will be displayed in its normal in-game Window. The PluginManager version of the options panel disappears when the in-game version is being displayed but will reappear when the in-game version is closed (using one panel prevents a situation where two options panels could be overriding each other). Added integration with Lunarwater's Waypoint plugin. If you have Waypoint installed, you can enable Waypoint on the MoorMap Options and then clicking on the coordinates of any annotations will display Waypoint with those coordinates set. Note, after enabling or disabling Waypoint you have to either change the currently displayed map or reload MoorMap for the setting to take effect. Updated several annotation icons to use the in-game resources. There are a number of icon resource IDs that I have still not identified. Removed Faction Rep Item Traders. Updated the Quick Annotation tool to support DE & FR clients. Fixed the Quick Annotation tool for the EN client (it had worked for EN prior to 1.13). Fixed the resizing bug introduced with the Character Location icon. Added Mirkwood, Lothlorien and Caras Galadhon default data. Added RoI maps and most of the RoI default data. This includes Galtrev, Dunland, Dunlending, Gap of Rohan, Nan Curandir, and Isengard. Some of the NPCs exist in different locations based on your quest status, especially in Dunland, so some of the locations are still missing. Added the Character Position button that places the character position marker on the map IF the character's coordinates are on the current map. This has to be repetitively clicked by the user to update the position but it's better than no marker. Fixed map dropdown positioning bug that was added in 1.06 when implementing hiding interior map names until hovering over the parent map name. Added a Default Map option so that users can set their own prefered default map. Hopefully Turbine will someday expose the map coordinates and heading to Lua so this will no longer be necessary. Changed the description popups to retain position as long as MoorMap is loaded. Added default data for Lone-lands. Note that a couple of the NPCs inside the Garth Agarwen instances have only approximate locations until I get a chance to actually run the instances. Added default data for Misty Mountains. Note, Helegrod and Goblin-town instanced locations are not yet included. Added default data for North Downs. Note, Fornost instanced location is not yet included. Added default data for Forochel. Added default data for Eregion, Walls of Moria, Annuminas and Evendim. Note that most of the interior maps for these areas are still not identified even though they are shown with the "Interior Map" icon. Those maps will be added over time as they are identified. Changed the Search List so that vendors, traders and other interactable NPCs show up under the NPC header. Added default data for Thorin's Hall Homesteads, Thorin's Hall (main floor and basement), Thorin's Gate, Falathlorn Homesteads, Ered Luin and The Delving of Fror. Fixed bug that didn't refresh view when "Select Default" filter button was clicked. Modified how Custom Annotations are stored. The global file only contains those annotations who's maps have not been loaded since they were modified. This will significantly reduce load times for those with a large number of custom annotations (once they reload each map with annotations at least once) and prevent those long load times in the future. Fixed the bug that prevented saving options changes when not in debug mode. Fixed mapID for Enedwaith stables and skirmish camp on Eriador map (they weren't showing on Eriador). Fixed typo in Southern Barrow-downs map name. 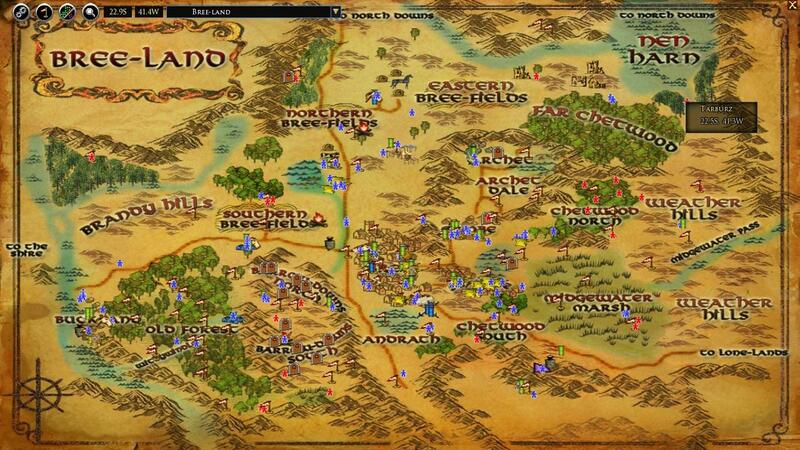 Added server specific Ettenmoors annotations for Brandywine, Elendilmir, Firefoot and Landroval. No other servers had special annotations noted at this time, but they will be added as people report them. Fixed a bug that would disable the coordinates in the Annotation Maintenance window when adding a new annotation after editing a default annotation. If I'm in Lothlorien and use the Alias/loc button on the map, or the /loc command, the map either opens the main Rhovanion map or the Great River map, depending on where I am. So, at Echad Andestel or in the Nimrodel area, I get Rhovanion map. At Vineyards I get Great River. Thanks for reporting this. There are actually two issues, the Lothlorien bounds were completely wrong (no idea how they got so messed up, probably a bad copy/paste). Additionally, the Great River bounds overlaps Lothlorien and will be adjusted slightly to better reflect the in-game map selection. Both issues are now fixed and will be released with ver 1.38 (I don't have an ETA as there are a few other tweaks currently being worked on). Thanks, again for your Plugins. How it is now whith supporting Russian. Bad, good or even better? Hi. The last Russian translation was prior to the Mordor update. Nothing since the "Battle of the Black Gate" map has been translated for Russian. You are welcome to recommend translations for the map names as well as the other strings in string.lua after index 347. FR and DE translations exist for Mordor and North Mirkwood but not U23. Note, only the interface and map names are translated. None of the annotations are translated, not even for FR or DE clients (the mechanism exists, just no actual translations). Last edited by Garan : 03-22-2019 at 03:48 PM. Hello, so I've been trying for the last couple hours to get a shortcut key to work so i can tag ore nodes in the world... And I just can't figure it out. I have a hard time remembering where stuff is on the map (memory problems) so this would be a huge help to me. The alias system Is beyond unfriendly to use. I saw you posted some command lines down below but couldn't figure out what to do with them. I've tried right clicking on the map while standing next to a node but that doesn't seem to want to work for me either, it just wants to create a pin on the map in the same location no matter where I'm standing or where I click on the map. As well as taking a long time to pick the type of pin i want to drop, name it, description, ect. The simplest approach for you would be to use the 'quick annotation tool' that was added for exactly the point of quickly and easily keeping track of items in the game world. The tool is an icon that looks like a flag. It is transparent unless you mouse over it so that it doesn't negatively impact game play so you may not have noticed it. Its default position should be in the top left of the screen (it can be moved by either holding Alt and then dragging it to where you want it (note, Alt must be pressed and held BEFORE you move the mouse over the icon. It used to use Ctrl + drag but SSG broke the Ctrl key for plugins a while back and haven't fixed it yet). If you are having trouble moving it, you can also open the settings (click the gears in top left of map) and enter coordinates for the icon manually. The tool will use your in-game location and whatever you have currently targeted to add an icon to moormap. Note, if your location coincides with multiple maps, the annotation will be added to all maps that match. I would not recommend adding every single ore node you come across, just a small sampling so you can later recall which map that type of node spawns on - I know some people that have added literally thousands of ore nodes and displaying MoorMap now negatively impacts their game play. Right clicking on the map will add the annotation at the location you clicked, not at the location of your character and does not attempt to determine the type of annotation for you so it is less useful for nodes, really only better for NPCs and points of interest where you might want to manually enter coordinates or a detailed description (with the quick annotation tool you'd have to add the annotation and then edit it to set a detailed description, slightly harder). As to people complaining about plugins, it is true that plugins are not necessary. They just make some aspects of the game a little easier to handle, especially where the built-in UI is limited. Turbine/SSG purposely limited the API to prevent automation so plugins don't have much impact on gameplay other than making it easier for some users to organize and find information or keep better track of frequently used skills, particularly those that need to be used in combinations. Those of us that played back in vanilla SoA days didn't have plugins. We made do with the built-in interface enhanced by external applications like Notepad for keeping track of our own info and websites to look up info from others. We played the game just fine. When plugins were introduced, the first thing I did was write AltInventory so I could see all of my crafting alt info without task switching to notepad. Not because it was necessary, it was just a little bit easier. Thank you so so much! Seriously exactly what I needed to know! I have a hard time remembering things, so sometimes I just get lost and can't remember where i need to be going. It's not all bad though, I get to see things like new multiple times lol. Forever grateful for the help, thoroughly enjoying this game and so glad the community has been pretty awesome so far! Last edited by Garan : 03-19-2019 at 09:45 AM. OK, the U23 update is finally released. 1) There are still a couple of Scourges from the resource instances that I haven't located - I'll add them in a later updated if I ever encounter them. 2) I included Sulferous Deposit locations for the Withered Heath resource instance before I realized their locations are semi-random and then forgot to go back and remove them before publishing. They will be gone in the next release (whenever that happens). FWIW, I have not abandoned MoorMap (although the U23 update has been significantly delayed, some of you may have run into me slacking off on the Legendary servers). In fact, I was inspired by my discussion with Therzok to dig back into the implementation of the local search panel and realized I had not revisited the search filter after I changed the way that annotations are loaded. Part of that change had actually made it possible to dynamically filter the actual annotations (as opposed to just filtering the list on the search panel) via the search filter without significantly impacting performance. That functionality has now been re-implemented and will be in the next release. So, thank you Therzok for bringing this topic up, I know this is not the functionality you were asking for, but your comments did inspire me to re-investigate this option. Last edited by Garan : 01-14-2019 at 09:28 PM. Hey, thanks for the solid answer and sorry for my late response. Yes, it seems like I have a different use case. We have 2 colors here used in my drawing, yellow and red. I used red to mark zones and slayer deeds I have not completed yet. Since I want to complete all of them, I want to have an efficient way to tackle the problem at hand. I'm only interested in exploration markers and deed numbers while in this mode. In example, I would like all deeds annotations and exploration markers that are _not_ in the red circles to not show up (even if that meant manually clicking them all the other deed markers to go away, since there is no API to query whether someone has completed a deed or not). When I only see the deeds I have to do, I can trace a path to make deed completion a less ardous task, as I only have to check the deed log once to disable the deeds I'm not interested in (i.e. already done), rather than have to check over and over to see which ones I have left. Switching between MoorMap and the actual map to see what's left to do is friction. So, I would count this as: remove things I've done from the map. Then, we get to the yellow color. When I only see the deeds I have left to do, I can simply trace the yellow path mentally when I see only 'interesting' nodes, not everything. On a more advanced level, it would be nice to have a button that traces a shortest path via dijkstra or the like, for you with the given visible markers. Much of what you are looking for will not work well with the file handling available via Lua. When I first wrote MoorMap I imported the default data during each update and saved that data in user data files - I had originally intended letting users show/hide or otherwise modify the annotation data (basically what you are asking for). Unfortunately, due to inefficiencies in the underlying code that handles the user data files, this led to excessive load times when switching maps (especially the larger regional maps) and I had to scrap that mechanism for the current process that loads all of the default data from .lua files which the Lua interpreter handles far faster and more efficiently than the Turbine implementation of .plugindata files. This eliminated the delays caused by reloading while switching maps but also eliminated the ability to customize anything in the default data such as a display state. Those running off SSDs wouldn't notice as much difference (it was still perceptible but not as annoying), but it makes a huge difference to any users using a HDD for their documents folder. The ability to show/hide individual parts of the Berry's Deed Data may be practical but I don't expect to be spending much time working on MoorMap (as previously mentioned, it has been in maintenance mode for several years as I've moved on to other projects that require my time - the plugin was written eight years ago, eons ago in software terms). Any customization would likely only persist until the user changes maps or unloads the plugin but that might suit your purpose. I'll make a note to look into this on my ToDo list but actual implementation would be a fairly low priority. Additionally, since we have no access to the underlying terrain, automatically drawing a best or shortest path is pointless as impassable terrain can not be detected. That would mean the shortest path would often be horribly incorrect. I once toyed with the idea of using my Lua line class to allow users to create their own lines within the plugin and save them but again, inefficiencies in the plugin system (we can't actually draw lines, the line class creates thin rotated windows to simulate lines) made the process clunky at best - it would be great if SSG gave us the ability to actually save images via Lua but since the API hasn't changed appreciably since 2014 (none of the devs that implemented Lua are still with SSG) I doubt we'll ever see any significant updates to the API, certainly not something as involved as image editing. Last edited by Garan : 12-30-2018 at 09:42 PM. I think I was referring to the overlay in a wrong manner, I meant individually hide each marker from the UI. Yes, I suspect there is a miscommunication due to terminology. As used in MoorMap (and mapping in general), an overlay is quite literal, that is, a transparency laid over a map. In the case of MoorMap, a transparent image used to denote a path to an objective, a highlight of an area, etc. drawn over the image of the map. The individual marks that are actually part of MoorMap are called Annotations (just a synonym of 'mark' commonly used to reference notes or other markings on a document). Annotations usually denote a specific item, npc or location coordinate. FWIW, I did consider making the annotations subject to the filtering of the local search panel but testing indicated it significantly impacted the performance of the filter text box, especially on lower end systems. I also considered adding an "update filter" button to apply the filter but it just didn't seem worth the time for what was essentially very little gain in functionality over the existing functionality.